I stopped by Emart last night after work to look for some cosmos flower seeds for Dad. I couldn't find any - sorry, Dad - but in the supermarket section I did spot something mighty familiar in the fridge section. OOH! 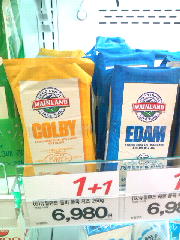 Mainland Colby block cheese! Edam too! Seriously, I actually made an audible gasp of happy surprise, skated myself across the supermarket floor to place myself in front of the colourful blocks. Ilove cheese, and while these are no French varieties, I always love my Kiwi Colby blocks for everyday dishes. Too bad I don't have the time to cook at home these days. They were on special, too. But if I bought it they would surely go bad even before I got a third of the way through. Oh, well..